Jiangnan of China, has enjoyed the'earthly paradise'reputation since ancient times. A typical canal town named Jin Xi, located in the picturesque scenery of Jiangnan, known as 'the hometown of Chinese folk museum' with two thousand years of history.There is an old saying here "thirty-six bridges must have seventy-two kilns." Lots of kilns were produced golden bricks in the past, and the brickkiln culture is so profound and indispensable for the town. Zhu Jiadian village is located on the west side of Jin Xi, still exists more than ten ancient brickkilns of Ming and Qing dynasty, although most of them have been abandoned, but a few are still in use. As the scale of production shrinks dramatically, the trend of hollowing out of the village becomes increasing seriously, the bustling land has lost the glory of the past. In order to make this historical and cultural village newborn, the designer was invited to be responsible for the interior renovation of an old large-scare brickkiln including a cultural museum and a folk inn. Brickkiln cultural museum was built along waterfront, facing the direction of Changbai swing, provides a pleasant hydrophilic environment. The ground floor is planned as light dining area and a small-sized theme classroom; the first floor contains brick-cultural exhibition area, a large meeting room and other functional spaces where people can feel a relaxed, natural and tranquil spacial atmosphere. 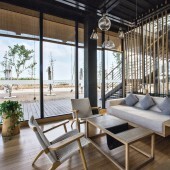 The second phase of the project is the new-built folk inn facing brickkiln museum across the water,totally has 10 small single buildings of 20 rooms with light steel frame system, which is the typical Jiangnan residential construction structure. The main theme of the interior design is extended with the index of architecture, extracting Jiangnan taste, brick culture and Chinese classical garden culture, aims to achieve the harmony and unity between modernity and tradition. As a public cultural space,the brick kiln museum will give more memory to local site,which would be rooted in the minds of young people there.Meanwhile,except for commercial purpose,the new built folk inn will also as a training base for the rural builders in the future.The kind of interaction is sustainable for the development of Jinxi town and even could arouse the inheritance of technique of ancient burning brick. For materials’ using,the designer chose native materials such as brick and bamboo, breakthrough combining and matching, to embody modernity of design while return to simplicity of material.Especially,large amount of low-carbon bamboo endows the space a sense of clarity with its fresh and natural characteristics, intending to express a modern spirit that focusing on nature and humane care.Some parts of spaces use local brick as decorative surface, to express respect for the history of the town burning brick. In lobby area, except for using floor-to-ceiling glass, the designer set up several skylights to bring in more natural light to the interior. With time changing, light and shadow would be enjoyed indoors. 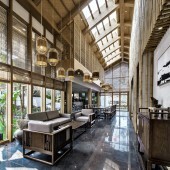 The smallpox is created by bamboo mat and wood structure, which adds a few natural and simple flavors for the whole space. Rooms are designed with various spatial layouts like tatami mansions and study room with different themed display, aim to make Jiangnan culture has a delicately extensive and profound unfolding. Under the corridor of brickkiln museum hall,the designer reorganized multi-functional space while preserving original architectural style, injecting new functions and formats such as water bars and conference rooms, where people can enjoy leisure time and meanwhile concerning the ductile learning of traditional culture. To echo architectural style of the local village, the folk inn and its courtyard are designed in keeping with the surrounding environment, retaining original courtyard space and reworking the new functions.In addition, the designer puts auxiliary space turning to outside and open, creating a dynamic street space, so the streets and lanes these original traffic space can undertake a wealth of public activities. Through flexible design techniques and innovative collocation ideas, the designer wishes brick kiln culture could be presented to the world in a more intelligent way, and hopes to keep original architectural style through its internal form , meanwhile continue the connotation and value of brick culture, so that people coming and going would remember that every story of the brick kiln here. In the future, it will be stationed in more formats and become the starting point for more township and village builders. 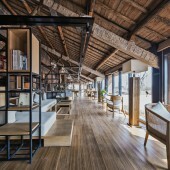 In order to make this historical and cultural village newborn, H DESIGN was invited to be responsible for the interior renovation of an old large-scare brick kiln including a cultural museum and a folk inn.In the future, it will also serve as a training center for exchange of ideas among rural make-ers, boosting local rural development. 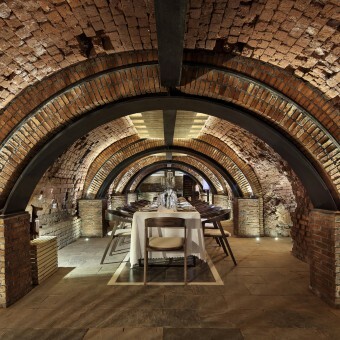 Particularly worth mentioning that is an Italian restaurant called Emanuele,located in the ground floor,the designer combined with unique geographical conditions of Jinxi’s ancient kiln to create the first kiln restaurant in China setting dining area, wine cellar, cigar bar and other functions, providing a charming gathering leisure place for people. Copyrights belong to H DESIGN, 2017. 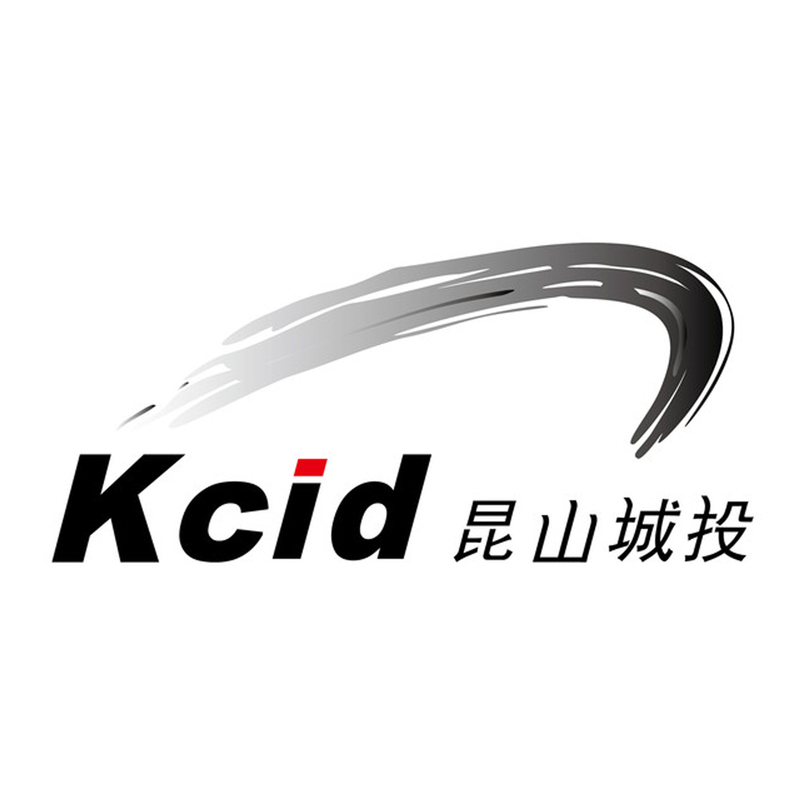 Kunshan City Construction Investment&Development Group Co., Ltd.
Kunshan City Construction Investment&Development Group Co., Ltd. (referred as “City Investment Group”) was founded in March 2004. Adhering to the concept of Serve City’s Development and Create High-quality Life and under the enterprise spirit of Quality and Livehood Oriented, Be Creative and Responsible, to Be Better and Stronger, the main task of City Investment Group is to carry out the strategic decision of the Municipal Party Committee and Government, operate in cooperation mood and do investment, construction and management in building municipal public space, improving municipal functions, renovation of the old town and other aspects, so as to provide a good living environment for the citizen. Since its establishment, City Investment Group, fully being the main force of constructing the city, have successively completed a number of major functional projects with a total construction area of over 400 thousand square meters and have successively completed a number of low-income housing projects with a total construction area of over 1380 thousand square meters and over 9000 sets of houses. To create high-quality public places, they have built six landscape corridors ,ten landscape sites and 32 kilometers ecological slow-life systems, which shall play important role in improving the urban functions, upgrading urban quality and protecting the people’s livehood. Brickkiln Folk Inn and Museum Make Village Newborn by Kevin Hu is a Nominee in Interior Space and Exhibition Design Category. · Click here to register today inorder to be able to view the profile and other works by Kevin Hu when results are announced. Brickkiln Folk Inn and Museum Make Village Newborn by Kevin Hu is Winner in Interior Space and Exhibition Design Category, 2017 - 2018. · Press Members: Login or Register to request an exclusive interview with Kevin Hu. · Click here to register inorder to view the profile and other works by Kevin Hu. Did you like Kevin Hu's Interior Design? Did you like Brickkiln Folk Inn and Museum Make Village Newborn? Help us create a global awareness for good interior design worldwide. Show your support for Kevin Hu, the creator of great interior design by gifting them a nomination ticket so that we could promote more of their great interior designs.